Quiz: How Do I Stop Snoring? Does your significant other often complain about your loud snoring? 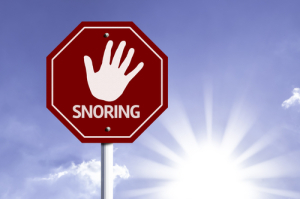 How do you stop snoring? In many cases, a person who frequently snores may be experiencing the symptoms of a serious sleep disorder. Known as obstructive sleep apnea, or OSA, patients may have difficulty sleeping and exhibit a number of uncomfortable symptoms. If we diagnose this disorder, non-surgical and comfortable treatment options are available. True or False: Snoring occurs when airflow is partially blocked. True or False: This is also a symptom of sleep apnea. True or False: Without treatment, you may run the risk of serious health complications. True or False: We can correct the issue with an oral device. True. When this occurs, the patient must force air through, which in turn vibrates the soft tissues that are obstructing airflow and causes the snoring sounds. The issue can lead to sleep apnea when the soft tissues completely block airflow. OSA causes patients to stop breathing for brief periods, until the brain wakes them up. They will often have no memory of waking and returning to sleep, but will feel exhausted during the day. True. Along with snoring, patients may experience daytime drowsiness, difficulty concentrating, irritability, depression, and may wake up gasping for air or possibly choking. If you recognize one or more of these symptoms, then consider having a diagnosis performed by a dental professional with experience in sleep medicine. True. Over time, OSA can lead to an increase in blood pressure, elevating the chances of developing stroke or heart attack. True. An oral device, which often resembles a mouth guard, will be worn at night. The device moves the jaw forward slightly; enough to tighten throat tissue and keep the airways open during sleep. Patients then experience a reduction in sleep apnea symptoms.